Newest attraction at Broadway At The Beach will be open for extended hours throughout the summer. Encounters is intended to inform, as well as entertain visitors. After viewing the exhibit, it is up to them to draw their own conclusions. 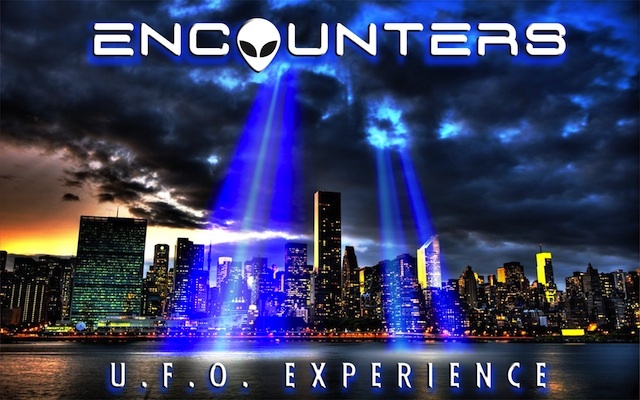 The world's first exhibition exploring historical and present-day reports of U.F.O.s and alien encounters will debut on April 4, 2013, at Broadway at the Beach, in Myrtle Beach, S.C. The exhibition, “Encounters: U.F.O. Experience,” presented by Intergalactic Brands, takes visitors on an interactive journey showcasing ancient mysteries, reported U.F.O. sightings and military involvement, and pop culture's fascination with aliens and outer space. Throughout April and May, the exhibition will be open Thursday from 11 a.m. to 8 p.m.; Sunday from 11 a.m. to 8 p.m.; and Friday and Saturday from 10 a.m. to 10 p.m. Beginning Memorial Day, Encounters will be open seven days a week, Sunday through Thursday from 11 a.m. to 8 p.m. and Friday and Saturday from 10 a.m. to 10 p.m. The exhibition is scheduled to stay at Broadway at the Beach through Labor Day before embarking on its world-wide tour. The family-friendly exhibition will feature seven galleries that incorporate over 200 original and reproduced artifacts, conceptual models, interactive experiences and documented film clips and recordings that support claims of the existence of alien encounters throughout history. Visitors to the exhibition will view replicas and models of artifacts like the famous Easter Island statues and Egyptian Hieroglyphics; explore the mysteries of Area 51 and Roswell; and have access to video and audio recordings, as well as testimony about alien encounters. The exhibition will also offer visitors two unique out-of-this world experiences. Based on the observations of thousands of people who have reported an abduction experience, one of the galleries will simulate a white light experience and another will recreate an abduction experience. Intergalactic travel will be explored with working models of propulsion systems and scientific explanations of the worm hole and black hole theories. There are also a variety of interactive experiences throughout Encounters such as an artificial gravity device that enables visitors to feel the effects of gravity in space. Encounters will also shine a spotlight on pop culture. Television programs, radio shows, books, websites and movies that have been devoted to alien encounters will be displayed, as well as replicas of props of famous Hollywood productions such as ET, Close Encounters Of The Third Kind, Aliens and Men In Black. “Encounters is intended to inform, as well as entertain,” said Brian Bouquet of The Event Agency, the company responsible for developing the exhibition. “Once inside the exhibit, visitors will have an opportunity to explore, and in some cases, experience simulated space travel. They will be able to examine evidence provided by UFOlogists and those who have reported having encounters with aliens. After viewing the exhibit, it is up to them to draw their own conclusions." The family-friendly exhibition will be located on the northeastern side of Broadway at the Beach in a building distinguished by a flying saucer bursting from its side. Tickets are on sale now and are $14 for adults, $12 Students, and $10 for children (ages 4 - 12). Children under the age of three are free. From now through April 3, tickets for adults and children are $10. Reservations for the Myrtle Beach exhibition can be made online at http://www.ufoexhibition.com, or by calling (843) 353-0046. Encounters: U.F.O. Experience presented by Intergalactic Brands is an out-of-this-world, family-friendly exhibition based on the widespread interest in U.F.O.s and alien lifeforms. It includes more than 200 original and reproduction alien artifacts, films, recordings, conceptual models and interactive experiences. Broadway at the Beach in Myrtle Beach, S.C., is the first stop on what is expected to be a worldwide tour of the exhibition. The exhibition's website, http://www.ufoexhibition.com, will be providing additional information as the opening date of the exhibition nears. Meanwhile, those interested in being among the first to know can go to the website and sign up to receive offers, discounts and other information directly.